Turned in a sharp 5f breeze in 1:00 3/5 before working same distance in 1:03 4/5 in company, as he preps for his 3-year-old debut in the Feb. 4 Holy Bull Stakes. You’re not looking for anything earth-shattering, just a good solid effort to show he’s made the transition from 2 to 3. Remember, he closed out the year with a 102 Beyer, and you don’t want to see him come out with guns blazing and make it difficult to improve off of. Right after his first two career starts, Casse began concentrating on harnessing some of his blazing speed, which he demonstrated in his debut going 4 1/2 furlongs and subsequent victory in the six-furlong Bashford Manor Stakes, run in a blazing 1:09 1/5. He’s become very professional with the help of blinkers, and Casse just has to keep him that way. We saw the Cat Thief come out in him in the Hopeful and certainly no one wants to see a repeat in that. But it appears that is well behind him. He does things effortlessly and appears to have great lung capacity. Wilkes has decided to wait a week and bring him back in the Feb. 11 Sam F. Davis Stakes at Tampa Bay instead of the Holy Bull, so we’ll have to wait for the showdown between him and Classic Empire. Wilkes and Carl Nafzger went the Tampa route with Street Sense in 2007. McCraken, like the champ, has shown his sharpness in the morning, breezing a bullet 5 furlongs in 1:00 2/5 at Palm Meadows. In his first three generations, he has three Breeders’ Cup Classic winners and a horse (Seeking the Gold) who was narrowly beaten by Alysheba in the Classic. He also traces in his tail-female family to Nodouble, who was as tough and durable a horse as you’ll ever see and had good front-running speed going long. He has passed along those traits to a number of his progeny. Dutrow is in no rush, keeping him short in the mornings with a pair of half-mile breezes followed by a 3-furlong breeze in :37 3/5 at Payson Park, which has a deep surface that gets horses fit in a hurry, so no need to do too much right now, especially looking ahead to the Gotham Stakes on March 4. His dam had great potential as a future stakes-caliber filly, according to her trainer Chad Brown, but an injury cut her career short. He really started to blossom around the time of the Keeneland September yearling sale. Because he was so athletic, with a good walk, and vetted well as a yearling, and being by hot stallion Uncle Mo, it was requested by his co-breeders, the Gunthers, to put him in Book 2, and they were disappointed when he was put in Book 3. Dutrow was the only buyer who showed any interest and got him for $200,000 for Team D. The Gunthers, who also race horses, regretted selling Mo Town, and as a result bred the mare back to Uncle Mo, even though his fee had gone up by then. Mo Town’s and McCraken’s Beyer figures both have reached only an 86, but they have increased with every race and should continue to do so at 3. With all the rain in Los Angeles and with Baffert traveling to London and then Florida this past week, it has prevented him from working, but he finally made the tab, zipping a half in a bullet :46 4/5, fastest of 19 works at the distance. Despite having the speedy Old Trieste as his broodmare sire, there is enough stamina in his female family to suggest he will go long…if he is as talented as he’s looked. Old Trieste is by A.P. Indy, out of a Vigors mare, so there is plenty of stamina in his family; he just happened to be an extraordinarily fast horse. Mastery’s third dam, Hopespringsforever, is a full sister to Miswaki, who despite being a sprinter, sired Breeders’ Cup Classic winner and Horse of the Year Black Tie Affair. Her dam, Hopespringseternal, is a daughter of Buckpasser, out of the classically bred Rose Bower. The main thing with Mastery right now is to see how he fares against stiffer competition. All the mechanics and the physical attributes are there. I love the steady and slight improvement each race on his Beyer figures. He began his career with an excellent 83 figure, then went up to 85 in the Hopeful, 88 in the Champagne, and 90 in the BC Juvenile. If he continues that trend, it should have him peaking on the first Saturday in May and well in range of a winning effort. He turned in a sharp half-mile breeze in :48 1/5 at Palm Meadows, second fastest of 28 works at the distance. It was only his second work at Palm Meadows, so he apparently is coming around quickly. He still hasn’t won around two turns yet, so that will be his first big test. Unless their pedigree is inundated with stamina and they have shown the ability to run away from horses in the final furlong, you never know until they do it. But when a horse wins back-to-back prestigious grade 1 stakes in photos, coming out on top in stretch battles, there is no questioning his courage and will to win, and that is a heckuva trait to have heading on to the Derby trail. Moved him up a few notches because of some impressive Trakus numbers. In the Remsen, he ran 22 feet farther than the victorious Mo Town and was the only horse to run farther than the winner, while running 66 feet farther than the third horse. In the Breeders’ Futurity, he ran 21 feet farther than Classic Empire, 48 feet farther than the runner-up, and 72 feet farther than the third horse. He also ran 47 feet farther than Derby Dozen horse Gunnevera, who finished behind him in fifth. It will be interesting to see what this colt is capable of with a ground-saving trip and not getting hung so wide. He breezed 5 furlongs in 1:01 2/5 at Tampa Bay, second fastest of 37 works at the distance, following that up with a sharp 6-furlong breeze in 1:13 2/5, and is on course to square off against McCraken and the highly regarded Irish War Cry in the Sam F. Davis Stakes. Training so well over the quirky Tampa Bay surface, we’ll see if it gives him any advantage. 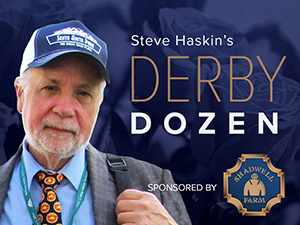 He’s been consistently working his 5 furlongs in 1:00 and change, and he continued the trend, breezing the 5 panels in 1:00 4/5, so it is apparent he’s bounced out of his gut-wrencher in the Sham Stakes in excellent shape. The question now is whether Shirreffs can or wants to get him to lay back a little farther off the pace. You don’t want to take a horse out of his comfort zone or take away his natural speed if that’s the way he wants to run. As long as he’s doing it well within himself. It is unusual seeing the ultra-patient Shirreffs with a horse that possesses this much speed, especially after his success with late closers Zenyatta, Giacomo, and Tiago. Most people don’t realize what a textbook job he did getting Giacomo to peak on Derby Day. And he did it by treating every one of his preps as just that. He wasn’t interested in winning as much as moving the colt forward, and that’s just what he did in each race. Giacomo then took advantage of a torrid pace at Churchill Downs and ran by far the race of his life. I loved seeing him bounce out of his powerful victory in the Smarty Jones Stakes with a solid half-mile breeze in :48 2/5. As a point of interest, his sire, a spectacular-looking chestnut, was destined for great things, breaking his maiden at Saratoga by 12 1/2 lengths and then winning the Iroquois and Ky. Jockey Club before suffering a tendon injury. Stonestreet was so devastated losing their big Derby horse, they went looking for one to replace him and wound up purchasing a colt privately who had just broken his maiden by just about the same margin as Tiz Wonderful. That colt, named Curlin, would put Stonestreet on the map for good. So you can say one horse’s misfortune altered the course of history. If you’re looking for durability in a family, Uncontested’s tail-female great-grandsire and great-granddam made 76 starts and 57 starts, respectively, and his fourth dam made 70 starts, and her only sibling made 129 starts. Great-grandsire Run For Nurse, is a half-brother to Gallant Romeo, who won the Vosburgh Handicap, as did Gallant Romeo’s daughter, My Juliet. It’s quite rare having a father and daughter win the same race. The only inbreeding in Uncontested’s pedigree is through champion grass horse Hawaii, who won the Man o’War Stakes and United Nations Handicap, defeating 1970 Horse of the Year Fort Marcy both times. He returned to the work tab with a half-mile drill in :48 flat. As game as he ran against a grade I winner in Gormley in only his second career start, we really don’t know much about him and what he is capable of. We know he can come from off the pace sprinting, as he did in his career debut, but he did outrun the speedy Gormley early in the Sham Stakes. As a son of the blazingly fast Bodemeister, can he rate off the pace if the situation warrants? That question should be answered when he goes two turns for the second time. Remember, even American Pharoah had to show he can rate off the pace, which he did in the Arkansas Derby, and subsequently did in the Kentucky Derby. It is very rare for a horse to wire the Derby field. Because he’s run only two times, for now, I’m going to drop him just a hair because I like the way No Dozing is coming along and feel he deserves to be ranked higher. Progressing toward his 3-year-old debut in excellent shape, breezing 5 furlongs in 1:01 at Gulfstream Park West followed by a 1:00 2/5 breeze, out in 1:13 4/5, according to DRF. He’s actually been working fast times at Gulf West for three months, including 5 furlong breezes in :59 3/5, :59 4/5, and :58 4/5. It’s obvious that Sano likes to let them run in the morning. If you’re wondering about Sano, the third generation horseman from Venezuela dominated the trainer’s standings, winning more than 3,000 races before moving to the U.S. with his family, where he continued to be successful. Attending the trainer’s school in Venezuela, he learned all aspects of the business and has shown he still has some old fashioned ways, wheeling Hy Riverside back in one week off a fifth-place finish in the Hal’s Hope Stakes to win the Sunshine Millions Classic, then brought him back one week later in the Poseidon Handicap. Gunnevera has run six times in four different states and has demonstrated a quick and powerful move. He just needs to improve his speed figures to show he can compete with the leading contenders. He’s as steady and professional as they come and always gives you that strong stretch run. He can beat you in workmanlike fashion as he did in the LeComte or he can win big as he did in his 6 1/4-length score in a Churchill Downs allowance race. His sire and grandsire both had tremendous two-turn speed and could carry it a long way, so he sure doesn’t take after them when it comes to running style. His second dam is a half-sister to A.P. Indy and Summer Squall by Seeking the Gold and his dam is inbred to Buckpasser through top-class broodmares Con Game and Lassie Dear, so there is a great deal of strength through the dams in his female family. He also traces to Blue Hen producer Missy Baba, whose daughter Toll Booth produced seven stakes winners and, like Missy Baba, was a foundation mare for the powerful John M. Schiff stable. Breezed a half in :49 3/5 at Laurel. The big question is how far he wants to go, as Exchange Rate is not known for siring classic-type horses. But it must be noted that his second dam if a half-sister to Canadian million-dollar earner and Queens Plate winner Regal Intention, and his third dam is a half-sister to Canadian Horse of the Year and champion 2-year-old Ruling Angel and also to Canadian 3-year-old champion and Canadian Oaks winner Tilt My Halo. And he does trace to Belmont Stakes and Travers winner Quadrangle. So there certainly is enough stamina in his female family. He’s won three in a row by an average margin of 8 1/2 lengths. Now we just have to see if he can continue to run that big against better competition. If you’re not aware of Lynch, the native of Derry, Ireland was a mainstay at Parx for a number of years before eventually following Parx director of racing Sal Sinatra to Laurel. His first stakes score came with Javerre in the 2013 General George Handicap. His horses have earned over $19 million. He has a younger brother, Feargal, who is a former champion apprentice rider in England and has ridden all over Europe and in Dubai. Every year at this time it seems we discuss Todd Pletcher’s arsenal of Triple Crown nominees and how he is dominating the 3-year-old scene in Florida with sheer numbers and late-developing maiden winners who consistently run off the screen. Of course, the Derby trail is not for the meek and many of them never make it. This year in particular, Pletcher, who is training at an obscene 37% win ratio, based off the beaten path at Palm Beach Downs, should by all accounts have almost half the Kentucky Derby field if these horses continue to progress. The ever-growing list of impressive 3-year-old winners include stakes winners FACT FINDING, SONIC MULE, TAPWRIT, grass horse MADE YOU LOOK, THEORY, and MASTER PLAN and spectacular maiden winners BATTALION RUNNER, FAJA, MALAGACY, and ALWAYS DREAMING. And his top 2-year-old, SYNDERGAARD, is not even among them. Also, he has BONUS POINTS, who has placed in three stakes, and WIN WITH PRIDE, fourth in the Remsen and Jerome. Pletcher’s latest stakes winner, Master Plan, captured the OBS Championship over the all-weather surface, and at this point looks to be headed overseas for the UAE Derby. His latest monster maiden winner is Always Dreaming, who romped by 11 1/2 lengths at Tampa Bay in his third career start. To show how dominant Pletcher’s maiden winners have been, the 8 3/4-length scores by Battalion Runner and Faja were his smallest margins of victory among the four. So, with this much firepower, Pletcher horses surely will be stampeding the starting gate on the first Saturday in May. It will be interesting to see how many he gets there. On the works front, unbeaten Fact Finding breezed a solid half in :48 and Faja went his half in a very sharp :47 3/5; that's pretty fast for Pletcher. How good is Battalion Runner? We’ll find out on Friday when he tries two turns for the first time in 1 1/16-mile allowance/optional claimer, where he will be an overwhelming favorite. Normally, you would expect Pletcher to rush a horse this talented into stakes competition, but this is a perfect spot to keep him moving forward. There is still plenty of time to run in the big stakes. Although there are some promising horses in the field of eight, including first-out maiden winner at a mile, PAINTER’S RAGS, as well as BEASLEY and FIRE FOR EFFECT and multiple stakes performer SILENT DECREE, Battalion Runner looks to be in a different class and his last Beyer number is on a different planet. I fully expect him to dominate this field and move up into Derby contention, despite not having run in a stakes. The horse Battalion Runner beat by 8 3/4 lengths in his maiden romp, LOOKIN FOR EIGHT, came back and broke his maiden by 3 lengths in impressive fashion on the Pegasus World Cup card, opening up by 4 lengths at the eighth pole before finishing under a hand ride for trainer Michael Tomlinson. Battalion Runner is a handsome battleship gray son of Unbridled’s Song who went for $700,000 as a yearling. He is very reminiscent of his sire in the way he moves. His pedigree looks to be geared more to a mile to 1 1/8 miles, with his dam being a full-sister to Breeders’ Cup Mile winner Tapizar. This is the family of Del Mar Debutante winner Call Now and Olympio, who excelled from 7 furlongs to 1 1/8 miles, but did manage to win the American Derby at 1 1/4 miles. Battalion Runner also is inbred to Unbridled through Unbridled’s Song and the dam of his broodmare sire Tapit. If he is as good as many think he is, he should keep stretching out on talent alone. As for Lookin For Eight, he drew off down the stretch despite never changing leads. The son of Lookin At Lucky, out of a Mineshaft mare, has plenty of stamina and should have no trouble stretching out to two turns. Runner-up BORSA VENTO ran on strongly in the stretch at 18-1 for Nick Zito. Keep an eye on third-place finisher EASTPORT, who was making his career debut for Shug McGaughey and closed fast while racing a bit greenly. He also should improve down the road as the distances stretch out. If you’re a true purist and are looking for a Derby horse to pull for, be aware that in his first two races, IRISH WAR CRY raced without Bute or Lasix and without blinkers or front bandages. His sire won the Preakness and placed in all three Triple Crown races, his trainer won the Kentucky Derby, and his female family traces to three legends of the Turf in Europe -- Arc de Triomphe winner Saint Crespin, Irish Derby winner Tambourine, and English Derby runner-up and champion sire Aureole, as well as the great Hyperion, Nearco, and Princequillo. So why in the world isn’t this horse in the Top 12? Let’s give him one more race to see if he settles this time going two turns. I have no doubt he will. He turned in a solid 5-furlong breeze in 1:01 at Palm Meadows. I have no idea how good the Steve Asmussen-trained HENCE is, but if you want a real treat, watch his maiden victory at Oaklawn Park on January 16. If you’re looking for athleticism in a colt, watch the way the son of Street Boss ducked in badly for no apparent reason with the race won and somehow managed to dig his feet in the slippery slop at the last second to prevent him from crashing into or going over the rail. By the time he recovered he had been passed by fellow Calumet Farm colt Horse Fly in deep stretch, but again somehow managed to level off and rally again, winning by three-quarters of a length. Despite all that, he still came home his last sixteenth is a quick :06 1/5. Again, there is no way of telling how good he is, but I can’t wait for him to run again. Also from the Asmussen barn, the stretch-running LOOKIN AT LEE, a fast-closing second in the Breeders’ Futurity and fourth in the Breeders’ Cup Juvenile, continues to train well, breezing 6 furlongs in 1:13 2/5 at Fair Grounds. And if you're looking for an under-the-radar horse to watch from the Asmussen barn, keep an eye on LOCAL HERO, who demolished a maiden field at Fair Grounds last week by 7 1/4 lengths following a pair of seconds in sprints. The son of Hard Spun has been on the lead throughout in his last two races, like his sire, and if that's the way he prefers to run, we'll have to wait to see how far he can carry that speed. He's certainly bred to go long. With Kentucky Derby points at minimum for 2-year-olds, the Japanese horse MONT SAINT LEGAME has all but secured a spot in the race by earning a whopping 40 points for winning the about one-mile Cattleya Sho at Tokyo Race Course at 2. Juvenile champion Classic Empire has earned 10 points less than Mont Saint Legame for winning the Breeders’ Cup Juvenile and Breeders’ Futurity. It is apparent that Churchill Downs is trying very hard to attract a Japanese horse again, especially after the performances of Lani last year in all three Triple Crown races. The question is what will the reaction be if or when a Japanese horse comes here and actually wins the Derby. Not saying it’s a good thing or a bad thing…just wondering how it will be viewed by American racing fans and Churchill Downs. Lani did build up quite a fan base here as he kept improving with each Triple Crown performance. Mont Saint Legame is a son of Came Home and has won both his career starts on sloppy and muddy tracks. Paul Reddam and Doug O’Neill have an interesting 3-year-old in SO CONFLATED, a son of Eskendereya who won the California Derby impressively over the Tapeta surface at Golden Gate. But he is already proven on dirt at Santa Anita and Del Mar and he possesses the kind of strong closing kick you always want to see. Let’s see where they go next with this ridgling, who is inbred three times to Secretariat. Speaking of Reddam and O’Neill, they teamed up to win the Cal Cup Derby with ANN ARBOR EDDIE, a homebred son of Square Eddie who has now won three of four with two stakes victories, and his only loss a third-place finish to Mastery in the Bob Hope Stakes. He is building up quite a rivalry with runner-up CALIFORNIA DIAMOND, who was beaten a half-length and finished well clear of the third horse. California Diamond certainly is no slouch, having made 10 starts already, with five wins and five seconds, including four stakes wins, two in open company, and a second in the Bob Hope. In the slip through the cracks department, Reddam has purchased a colt privately named ROCKIN RUDY, who sold for $100,000 as a yearling to John Brocklebank, who tried pinhooking him in three different sales at 2, but withdrew him each time. He ran him for an $80,000 claiming tag last August at Del Mar and the son of Midshipman won by 11 1/2 lengths in a swift 1:03 2/5 for the 5 1/2 furlongs. He hasn’t run since, but has been tearing up Santa Anita in the morning, his latest work last Friday a 5-furlong drill in :58 2/5. Derby or no Derby, he should be fun to keep an eye on. PETROV, a hard-trying second to Uncontested in the Smarty Jones Stakes, will look to avenge that defeat in the Southwest Stakes February 20. But trainer and co-owner Ron Moquett said, although the Southwest is the race in which he wants to run, he will explore other options around the country as well just in case. Petrov gave him the first positive sign, breezing a sharp half in :48 in company. Look for this horse to keep improving, especially when he gets in races with a more contentious pace so he doesn’t have to do all the dirty work chasing Uncontested. Larry Jones, disappointed with RUNNING MATE’S ninth-place finish in the LeComte Stakes, has sent the son of Creative Cause to a clinic for evaluation. ROYAL COPY, runner-up in the Hopeful Stakes who suffered an ankle chip, is back galloping for Wayne Lukas, but is way behind and looks to have run out of time. Lukas does have WARRIOR’S CLUB, fourth in the Smarty Jones, as a possibility for the Southwest Stakes. Also at Oaklawn, ROWDY THE WARRIOR, third in the Smarty Jones, breezed 5 furlongs in 1:01 4/5 and will run next either in the Southwest Stakes or a first-level allowance race. Del Mar Futurity winner, KLIMT, who disappointed in the Breeders’ Cup Juvenile, will be given some time off by new trainer Art Sherman and will not be pointed for the Derby. Oak Tree Juvenile winner DANGERFIELD, a well-beaten third in the Delta Downs Jackpot and Los Alamitos Futurity ,is heading for Saturday's Robert Lewis Stakes. ILIAD, who broke his maiden in December for former trainer Bob Baffert, blazing 6 furlongs in 1:08 1/5 at Los Alamitos, worked 6 panels in 1:14 1/5. In his first start, he tired badly to finish ninth, so his second start was a gigantic improvement. He is a son of Ghostzapper with a pretty obscure tail-female family. The Baffert-trained IRISH FREEDOM, who broke his maiden in stylish fashion last August at Del Mar, finally has returned to the work tab, and came back running, breezing 3 furlongs in :34 4/5. What I love most about this colt is that his dam traces to the rarely seen Cougar II, one of the most underrated horses of all time. Obviously, he is way behind and should be looked as more of a down the road horse. BALANDEEN, a son of Bernardini who was a solid second to McCraken in the Street Sense Stakes before finishing fifth in the Delta Downs Jackpot, returned to the work tab with a bullet 3-furlong breeze in :35 flat at Oaklawn Park. The Chad Brown-trained BOBBY ON FLEEK, named after Bobby Frankel by owner and breeder Louie Lazzinnaro, had his first breeze since finishing a distant second to Syndergaard in the Funny Cide Stakes in the mud. The son of Frost Giant had previously won his debut at Belmont Park by 6 lengths. New York-bred JAIME’S ANGEL, showed huge improvement stretching out to two turns, breaking his maiden at Aqueduct by 5 3/4 lengths following three out-of-the money efforts sprinting. Remington Springboard Mile winner COOL ARROW has been entered in the February 4 Keith Gee Memorial overnight stakes at about a mile on the grass at Fair Grounds. He’s been training at the Evangeline Downs training center.